The family had a gathering today that happened to be at a relative’s house that lives on a beautiful private lake. As one might expect, I had fishing gear in tow. As one of my goals this year was to do more fly fishing, I took a 7 wt. fly rod as my weapon of choice. Although I was mostly going to be targeting Largemouth Bass and Bluegill, this was the scene of my first ever Grass Carp catch and went a little heavier in case one bit. Without the potential of these carp, I likely would have just taken the 4 wt. I also brought along one spinning rod in case the fly fishing wasn’t working out. I’m far from a purist, I just want success! While it did prove to be overkill using the 7 wt., the fishing was fantastic and numerous Bluegill and Largemouth Bass were caught. All of the fish hit on a rust colored Woolly Bugger. 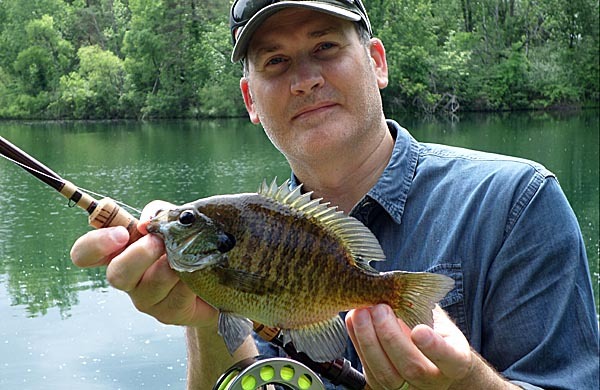 Three Bluegill were well over the 9″ Fish Ohio Award length, while all of the bass ranged from 11 to 14″. 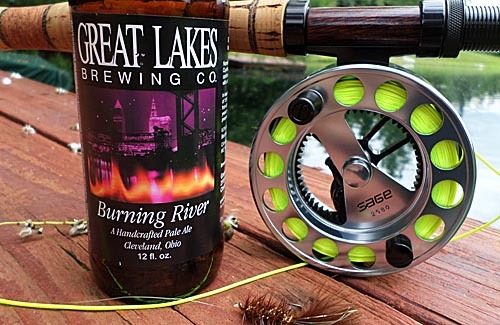 It was easily the best fly fishing I have ever done, as far as numbers vs. the time fished. Truly, a banner day. So after getting my fill of the fly rod, I switched over to the spinning. I was seeing tons of Grass Carp, but was not successful coaxing one to hit a fly. I took a bobber and placed a hook about 4 inches under it, and then took some long blades of grass and tied them onto the hook. This was getting a lot of attention from the fish and sometimes right as the bobber hit the water, a fish would swim over to inspect it. After tons of experimenting, I finally was getting the fish to feed on the offering. Unfortunately, I was too excited and kept pulling the hook out of the fish’s mouth before it truly had it good enough. This was getting very aggravating, but I reminded myself that this was my first time targeting the species (the only one I had ever caught was inadvertent and only saw it after it was hooked) and it would take a bit more figuring out. 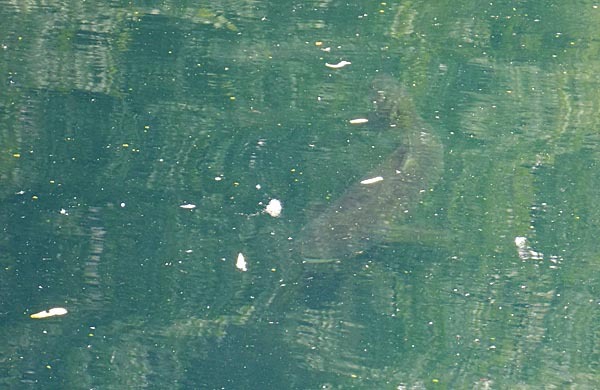 The scenario kept playing out where a monster fish, like the one pictured to the left, would either swim up to the bait or take it – only to have me miss. I must have pulled the hook out of 4 or 5 fish before I finally was patient enough to let the fish carry the food away before setting the hook. When I did finally nail it, the sensation was awesome! The drag was screaming and I can’t begin to describe how good it felt to have such a heavy big fish on the line. It changed directions often and it would actually create a wake towards shore when it did. When it splashed, it wasn’t the high pitched light sprinkling water sound, it was more of a dull thud and ‘whooosh’. As I kneeled on the dock, praying the fish wouldn’t come off, all of the family came down to see the action. I didn’t bring a long handled net, which only further complicated trying to get it landed. Every time it got close to the dock it would spook and take off again. Finally, it decided to go under the dock which turned out to be a help to me. As it swam out from under it, it didn’t get much of a chance to see the net come down and that was it. Landed! While the net was short handled, it had a deep basket. The fish still exceeded this length, with a good portion of it hanging out, as you can see above. On shore, everyone just commented on how astonishingly big it was. We hurriedly took a measurement that put it just under 40″ and then I prepared for some photos. 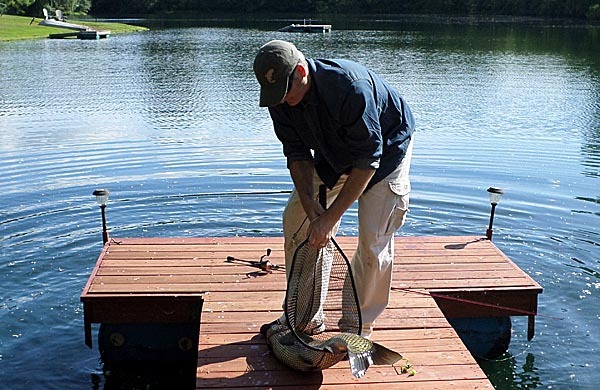 While being measured, the fish got a little ‘dirty’ so I decided I would let it revive in the water and clean it off. This proved to be a huge mistake, as the power of the fish in the water overwhelmed me, and it got away. So much for any type of ‘hero’ photo of me with the catch. At least I had a lot of witnesses, and got to experience the catch with a lot of family. It was sad though, as this was my lengthiest freshwater catch, with no great photo. In its own way, the photo above has an artistic qualities and some personality to it – and captures the moment fine.